FA WSL 2 champions Doncaster Rovers Belles signed off the season in style with a convincing 4-0 win over Oxford United, which included a Jess Sigsworth hat-trick. Sigsworth aided her hunt for the golden boot as she converted a penalty after 16 minutes, stepping up to the spot after Oxford keeper Lucy Thomas fouled Kirsty Hanson in the box with the winger clean through on goal. The Belles doubled their lead nine minutes later through Rhiannon Roberts, who got up to meet a well-worked short corner and nod the ball into the bottom corner. Sigsworth’s 17th of the season followed just before the break, and again it came from the spot after the striker was hauled down by Oxford winger Chloe Chivers. The Belles’ celebration party continued as Sigsworth completed her first hat-trick of the season on 75 minutes, placing the ball into the bottom corner off an excellent ball from debutant Kirsty Smith. Doncaster end the campaign with just a solitary league defeat and collected the trophy after the match, while Oxford finish eighth in the table. Doncaster head coach Neil Redfearn: “The girls have performed well all season. I said to them before the game, the season has finished and this is the start of the new season. And we’ve come out with a 4-0 win, which is important because that’s the right message to go out with. “The idea now is to build on that and try and keep as many players as we can, but it’s like anything else where if you’re successful you get everyone else coming and looking at it. Oxford manager Andy Cook: “The game today was always tough. Two penalties and a set-piece in the first half has killed us and then second half we’re quite happy with the performance. “We changed a few things around tactically and were able to come out of the game with a little bit of pride. 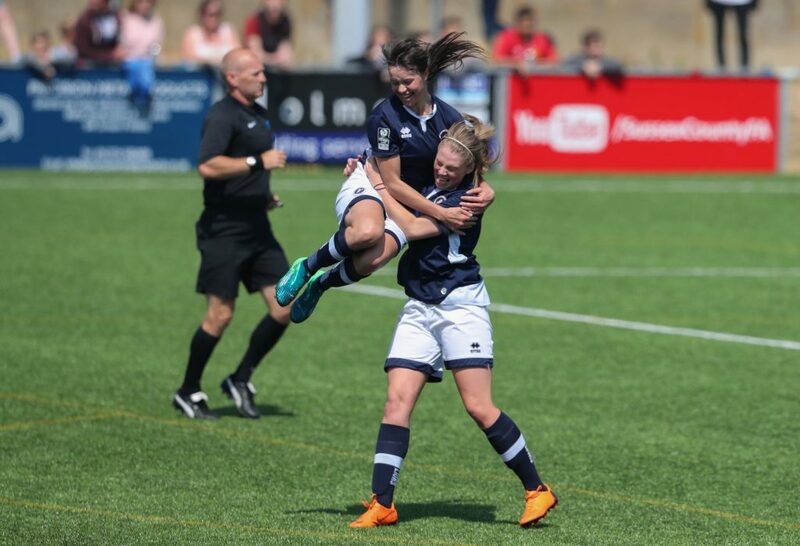 Impressive goals from Rianna Dean, Anna Hincks and Ella Rutherford capped a strong FA WSL 2 season for Millwall Lionesses as they secured a league double over Brighton & Hove Albion. Following a handful of untimely injuries to key defenders, Albion fielded both captain Danni Buet and forward Fliss Gibbons alongside Laura Rafferty in a back three. However they struggled to contain the physical presence offered by Charlie Devlin and Rianna Dean for much of the first period. Millwall soon capitalised on their early dominance, as Dean’s acrobatic effort following a deep cross from Megan Wynne beat Laura Hartley at her far post to give the visitors a deserved lead. Kate Natkiel’s dipping long-range strike following a swift counter attack was pushed onto the bar by Sarah Quantrill, as the winger’s shot proved too powerful for the goalkeeper to hold. Substitute Ashlee Hincks put the game beyond Brighton’s reach as the Lionesses capitalised on Rafferty’s failure to clear her lines, and the midfielder fired a fantastic strike over Hartley. Fellow substitute Ella Rutherford added gloss to an already impressive victory, as the winger’s bicycle kick looped into the back of the net. It was not enough to change the final standings though with Brighton finishing as runners up to champions Doncaster Rovers Belles, one point ahead of Millwall in third. Megan Wynne, Millwall wing-back: “We had our game-plan and knew they were obviously a really good side, but as we have all season, we showed our class, our ability. They’ve got all the facilities and the money, and we’ve dug deep. Yes they have good players, but we had that extra fight in us. Kate Natkiel, Brighton winger: “If we had just taken our chances in the second half, it could have been a very different game, so that’s something to work on going forward. “The difference was that they took their chances, and they scored some good goals so credit to them. 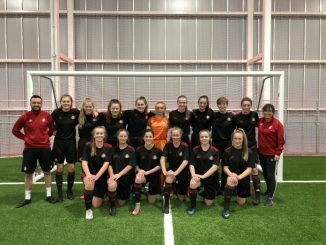 Melissa Johnson slotted a first-half hat-trick as Sheffield FC held off a determined Aston Villa fightback to edge a seven-goal thriller at Tamworth FC. 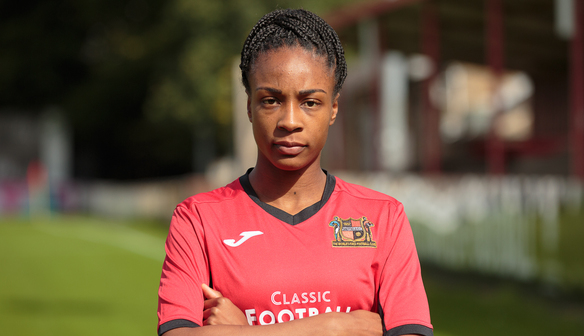 Victory wasn’t achieved without cost as Sheffield FC lost Sarah Jackson stretchered off with a knee injury and they were still down to ten players when Jade Richards nodded Villa in front from a Chloe Jones corner in the seventh minute. Johnson levelled within a couple of minutes and walked around Aja Aguirre to give Sheffield a 31st minute lead after Emma Johnson’s shot was blocked. Chloe Dixon hooked home from 12 yards after Melissa Johnson’s cross was punched into her path by Aguirre before Johnson completed her treble with a clever lob from just outside the box. Momentum changed in the second half after the lively Jodie Hutton ran onto an Elisha N’Dow clearance to coolly slot past Danielle Gibbons in the 48th minute. Hannah Cain, one of four Sheffield players to receive treatment during a hectic afternoon, finally gave way before Beth Merrick lofted the ball into the net in the 71st minute. Richards saw a header clip the post as Villa just fell short of repeating their sensational fightback from 4-1 down to win 5-4 on the corresponding day of last season. Villa’s Chloe Jones, who is hanging up her boots after the game, said: “I feel emotional having been here for five years. I think some of the girls think I’ll be turning up again come pre-season. “We could have been leading in the first half but we made some silly mistakes and that’s been the story of our season. “These girls are full of character and we kept believing until the final whistle that we could turn this one around. “I’ll miss being part of this very much but now it’s a time for the younger players to take the club forward. 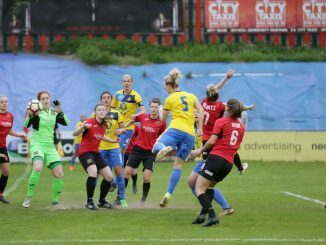 Sheffield FC skipper Ellie Gilliatt said: “I was fully aware what happened here on the last day of last season as I was watching as part of the Durham side when Villa came back from 4-1 down – it wasn’t happening again. “We were clinical when the chances came and Melissa Johnson pulled one out of the bag with her third goal. “In the end we were very tired having played five games in two weeks and in the heat. “We’ve finished the season really well with one defeat in eight games – it’s a shame we didn’t start better in the first half of the season. Becky Salicki struck her first goal of the season on the final day, as Durham wrapped up what has been a satisfying campaign with a 2-0 victory at Watford. 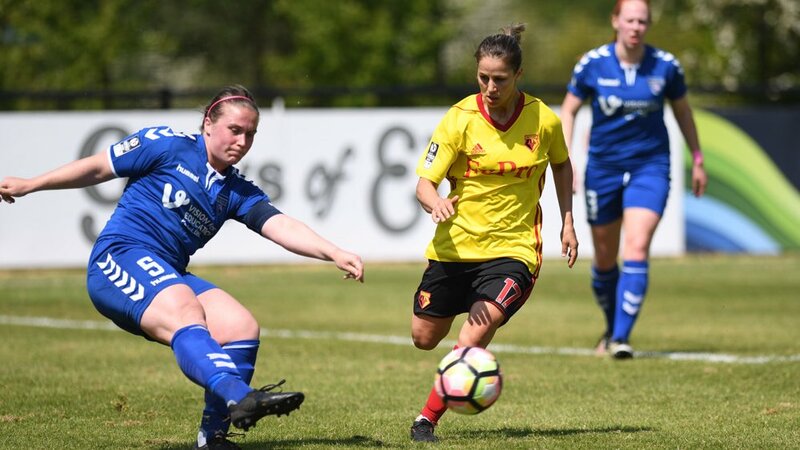 The victory secured fourth place for the Wildcats after racking up their fourth win in five games, while Watford end at the bottom of FA WSL 2 after a testing season. Durham took the lead after eight minutes when centre back Salicki rose at the back post to plant in a thumping header from Beth Hepple’s corner. Fran Kitching then prevented the visitors from quickly doubling their advantage by brilliantly keeping out a curler from Zoe Ness that looked destined for the top corner. The Golden Girls came within a whisker of equalising when Linda Afuakwah’s shot agonisingly rolled against the foot of the post. In the first minute of the second half, Simona Petkova prevented her side from falling further behind when she cleared Sarah Robson’s header from another Hepple corner off the line. But the Wildcats eventually made the game safe when substitute Jordan Atkinson’s powerful shot was parried up in the air by Kitching, only for the ball to drop into the net. Watford winger Linda Afuakwah said: “It’s been a tough season, but I’m grateful because of where I started it and now I’m getting to play in games. “I think the coaching staff here are amazing because when they see a good young player they give them a chance. 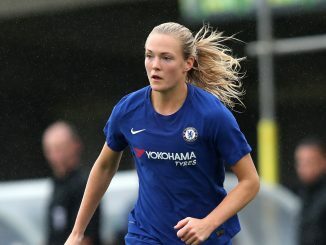 Durham defender Becky Salicki said: “I don’t know how Watford are bottom of the table, to be honest, because they are a good side, but at the end of the season we’ve finished with three good wins and three clean sheets. 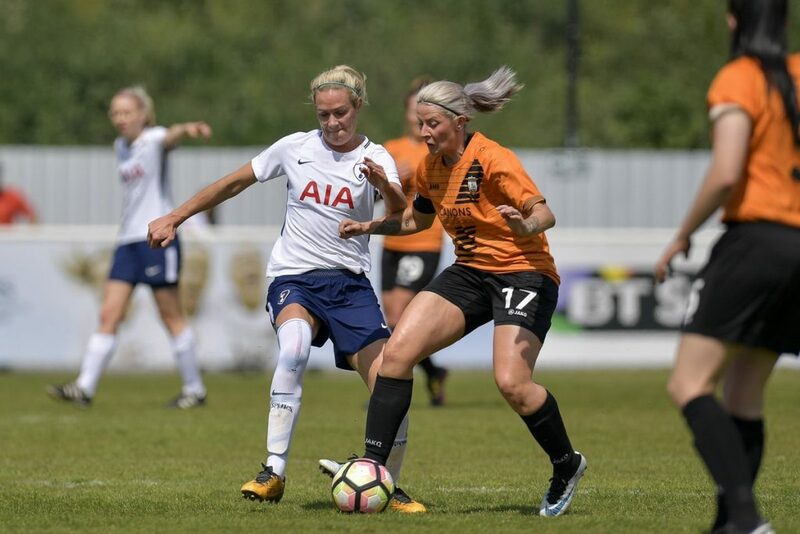 Taylor O’Leary earned London Bees a draw that allowed them to finish above London rivals Tottenham Hotspur on the final day of the FA Women’s Super League 2 season. Spurs’ Sarah Wiltshire had two chances in as many minutes midway through the first half, the first was heroically cleared off the line, the second was fired just wide of the right-hand post. Bees’ best chance of the first half came when a cross came in from the left but Rebecca Anderson’s volley was well saved by Toni-Anne Wayne. It was Spurs who took the lead in the opening five minutes of the second half, when Bianca Baptiste was put through again and this time she coolly slotted it past Nicola Hobbs to give the home side a deserved lead. Bees levelled 59 minutes after an Ocean Rolandsen cross was parried by Wayne into the path of O’Leary who fired into the roof of the Spurs net. Tottenham goal-scorer Bianca Baptiste said: “I think that the team played really well, we had our chances and unfortunately we did not finish them but the girls worked really hard for the full 90 minutes in this weather, which is amazing, I think we did really well. London Bees striker Katie Wilkinson said: “Once we got settled down after that 20-minute mark, we were able to get the ball down and play some good football. “We went one goal down which was disappointing but we got the goal quickly back and we could have scored again near the end but 1-1 was a fair result.